When I was little, I found a necklace in the middle of one of the roads in my hometown. It was a teardrop-shaped pendant strung on a dainty, gold chain. I'm assuming that, during its time in the road, it had been run over because the ruby in the center of the pendant was cracked. Despite that, I was still so excited to find it and, to this day, I keep it in my jewelry box. 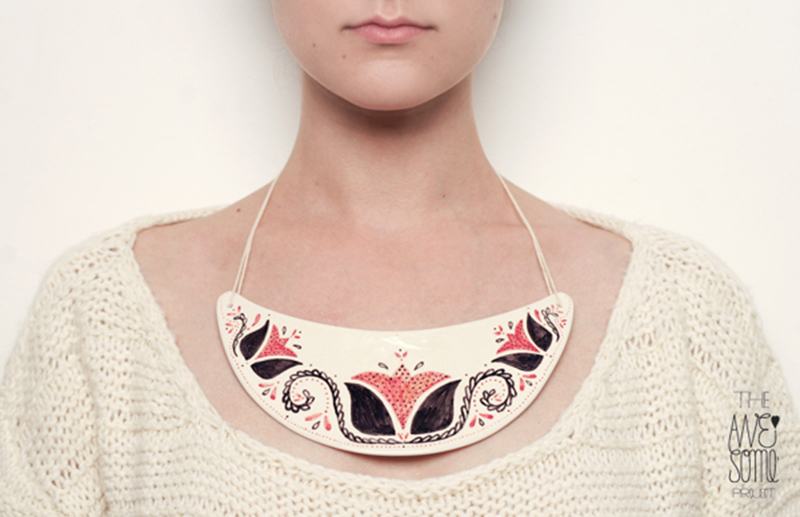 This necklace was not only beautiful, it came with an interesting story to tell. To me, jewelry with a story is the best kind. These stories can act as conversation starters or just as subtle self-reminders of where, when, or how a certain piece was discovered. Most often, it's vintage jewelry that comes with a story. But, sometimes new jewels can come with stories as well. Take, for instance, these pieces created by illustrator Madalina Andronic and Claudiu Stefan. 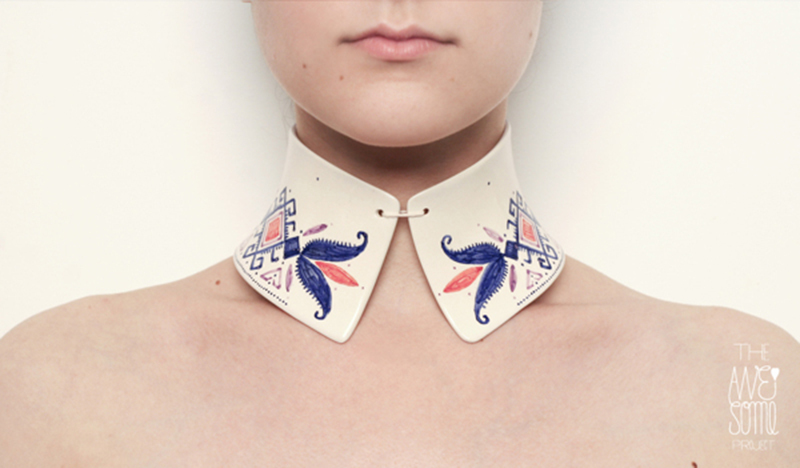 They are part of The Awesome Project; a collection of jewelry and other objects made of porcelain and hand-painted in a style influenced by Romanian folklore. While these pieces are technically new, each one comes with an allusion to the rich history of Romanian folklore as well as all the thought, time, and care involved in its creation. These pieces would make fabulous conversation starters. To find out more about The Awesome Project and see more pieces from the collection, be sure to check out the website. 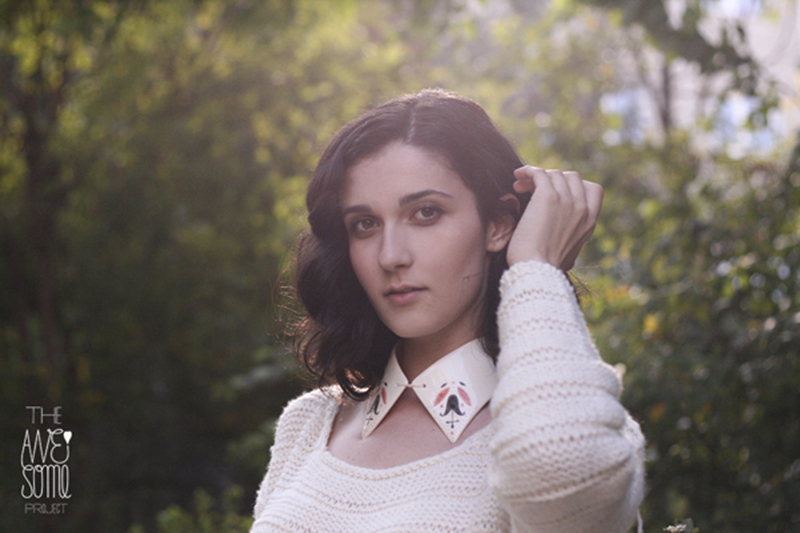 To order a piece, write the artists at weheartawesome[at]gmail[dot]com. ...and don't worry if jewelry's not your thing. They have other objects to offer; all of them hand-painted porcelain and all of them beautiful.